Contest | Win Tickets to Mamby On The Beach! Once again Journalist Without A Beat has partnered with React Presents to send YOU, the loyal fans and readers to this year’s Mamby On The Beach on June 24th-25th at Oakwood Beach. 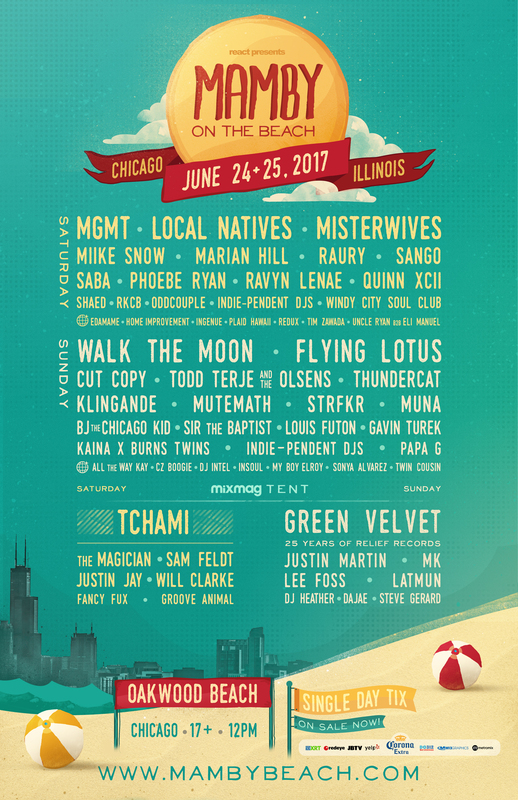 With a lineup that features the likes of MGMT, Miike Snow, Saba, Raury, Flying Lotus, BJ The Chicago Kid, Misterwives plus a MixMag tent that will feature the mixing talents of Tchami, Green Velvet, and more – This is guaranteed to be the music festival that gets you into that “Summertime Chi” mood. The rules to enter this awesome ticket giveaway are quite simple. The winner will be chosen randomly through a random generator and will receive a PAIR(2) of General Admission tickets to Mamby On The Beach. The winner will be announced and contacted once the contest concludes on June 15th. GA and VIP Tickets for Mamby On The Beach are available now, you can purchase HERE. Must be 17+ to enter. Contest ends June 15th. Winner of contest will receive (1) pair of tickets/wristbands to Mamby On The Beach on June 24th-25th. Tickets are not transferable and will need to be picked up by the winner with their photo I.D. in order to claim their tickets. Winner will be notified on the day contest ends. If said person doesn’t respond in a reasonable time, a new winner will be chosen. Journalist Without A Beat Contest | Win Tickets to Mamby On The Beach!